The first day of school often fills children with feelings of excitement and nervousness. Reading about characters undergoing similar experiences can help with this transition. Of the many stories that focus on starting school for the first time, a few stand above the rest. Below are what I have found to be the best books for quelling first day jitters. I hope you and your children enjoy the books and have a great first day of school this year! I love the Llama Llama series and this is one of my favorites. I read it with my son when he went to preschool for the first time and it definitely helped ease his trepidation of staying at school without me. Simple rhymes tell the story of little Llama on his first day of school. At first Llama is feeling apprehensive about leaving his mom and starting school. He observes the other children playing and having fun, but does not participate himself. Finally, during snack, Llama feels overwhelmed by the absence of his mother and breaks down in tears. The teacher gently reminds him, “Don’t be sad, new little llama! It’s OK to miss your mama. But don’t forget- when the day is through, she will come right back to you.” Feeling reassured, Llama joins in playing outside with the other children. He enjoys the rest of the afternoon, but still jumps for joy upon his mother’s return. 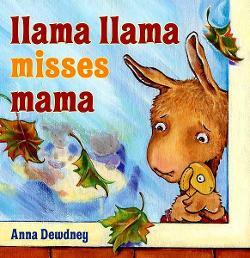 The story ends with the comforting words, “Llama finds out something new – he loves Mama…and school, too!” This is a wonderful book to use with children who have separation anxiety or who just need a little encouragement about starting school. It serves as a gentle reminder that parents always come back and that it is okay to have fun without them. Owen does not want to return to school, but his mother comforts him by saying, “I love you when I’m with you and I love you when we’re apart.” Subsequent pages show Owen in school making mistakes as well as good choices. 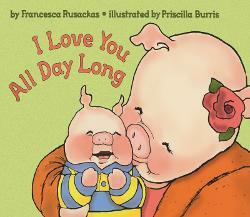 Each page includes his mother’s reminder that she loves him no matter what. “I love you when you share your favorite purple crayon. I love you when you accidentally make a mess. I love you when you have to call for help. I love you when you figure things out for yourself.” This sweet story should provide comfort to young children starting school and encourage them to take risks. This is a classic book that is often used for students entering school for the first time. Chester raccoon is nervous about starting school. 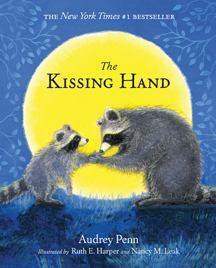 His mother reassures him and kisses his hand, so that he will still feel her love even when they are apart. Anytime he gets nervous he can look at his hand and remember his mother loves him. 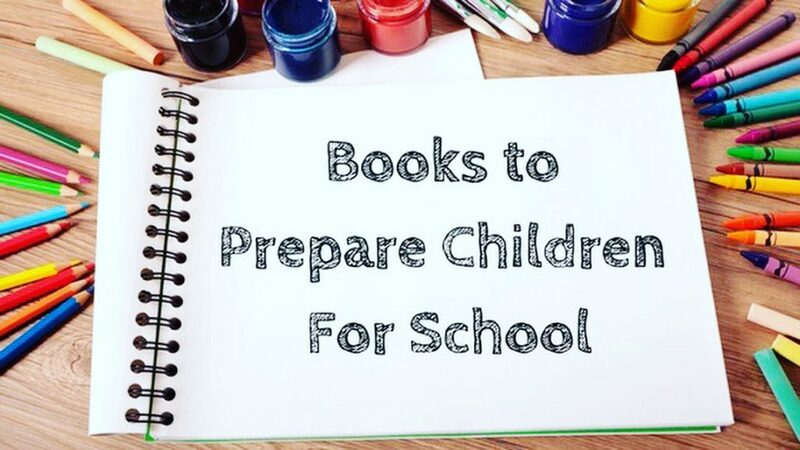 This is a picture book that has withstood the test of time and provides a great way for parents to reassure their own children about starting school. 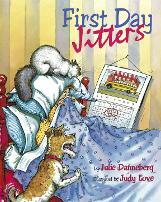 While most books about starting school focus on the first day, this one actually takes place on the second day. Digby, a small grey mole, had a terrific first day of school, but doesn’t understand why he has to go back again. He is worried that he will forget where to line up and where to hang his jacket, so he asks his mother to stay with him at school. She cups her hand, blows in a dozen kisses, and then slips them into Digby’s coat pocket. Whenever he feels nervous throughout the day, he pulls out a kiss to make him feel better. He has a few anxious moments where he needs a kiss, but then makes a new friend and realizes he doesn’t need them after all. 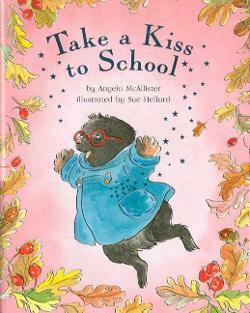 This is a sweet story that will hopefully leave readers with a way to combat their own nervousness and aid in transitioning to school. This is not a traditional book about going to school, but I think it is a wonderful story for this time of year because many fears about going back to school revolve around making mistakes and failing. 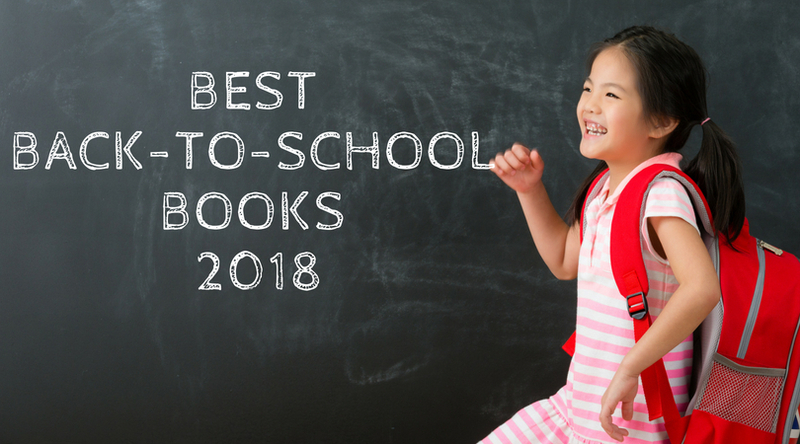 This book has a wonderful message that can not only apply to quelling back-to-school fears, but it also encourages children to try new things and be okay if they don’t work out. We can all learn from making mistakes and I think it is important for children to understand that from an early age. Todd Parr is a renown children’s author and illustrator who has created many wonderful books with important messages for children. A few of my other favorite Todd Parr books include The Family Book, It’s Okay to Be Different, The Feelings Book, and The Peace Book. It is the Pout-Pout Fish’s first day of school and he is nervous. He enters several different classrooms and finds that he cannot perform the tasks the class is working on. He repeats his sad song, “Trouble One: I’m not smart!/ Trouble Two: I’ll never get it./ Trouble Three: I don’t belong!/ So Four: I should forget it!”. Eventually the Pout-Pout fish tries to leave school but is luckily found by his teacher who informs him that he is not supposed to know everything yet. His pessimistic chant is replaced with a more uplifting one, “Fact One: We are smart! Fact Two: We can get it! Fact Three! We belong! And Four: We won’t forget it!” I think children will relate to Pout-Pout Fish feeling out of place and worrying about not being smart and will then be comforted in the message that school is a place to learn new things and students shouldn’t be nervous about not knowing how to do things before they get there. 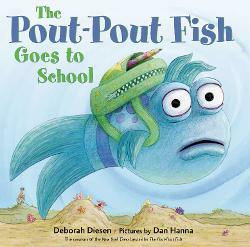 This is the third book in Diesen’s Pout-Pout Fish series. One cannot resist making a pouting face when reading these adorable books. 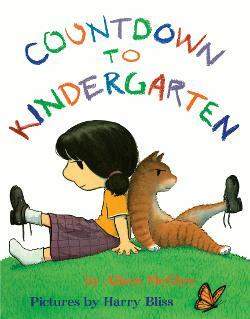 Another great read that captures young children’s anxiety about starting kindergarten. 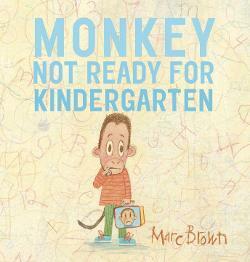 Despite Monkey’s reassuring parents, Monkey feels that he is just not ready to start school. He worries about everything from his teacher not liking him to the school not having red crayons. Each day Monkey’s family continues to reassure him until the last few pages reveal a wordless spread of Monkey entering the school doors and having fun. This book is a standout to me because it presents parents with ideas of how to ease the transition of starting kindergarten. For example, the book reveals Monkey and his parents playing school together, reading books about school, giving a secret good-bye handshake, etc. Monkeys adventures do not end here; the second book in the series is Monkey Not Ready For the Baby and the third book, Monkey Not Ready for Bedtime is coming out September 19th, 2017. Marc Brown is the author to many other picture books including the Arthur series. 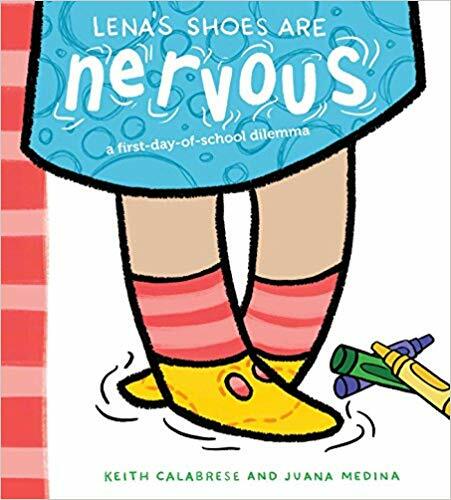 While many books focusing on the first day of school have a more serious undertone, I love this one because it is both silly and reassuring at the same time. 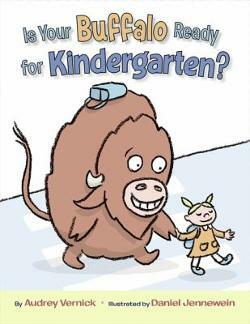 A little girl brings her buffalo to kindergarten and he worries that he will not fit in. He hesitates when asked to finger paint with his hooves, but the book prompts readers to remind him that finger painting is supposed to be messy. Everyone is different and this book teaches readers that that is a good thing. As the author says, “Everyone’s special in his or her own way. That’s the kind of thing you learn in kindergarten.” I love this simple, but powerful read. The illustrations and the storyline are absolutely charming and create a unique and winning back-to-school book that children and adults are going to love. This is a wonderful spin on back to school books. While Oliver is excited for school, his dad is so nervous for the first day that he gets a stomachache. After dropping Oliver off at school, his dad returns home worrying so much that he runs back to school only to see the fun that Oliver is having. 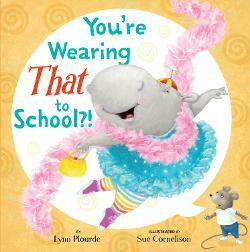 This reassuring read is sure to bring smiles to children and adults alike. A book with a similar theme is Mom, It’s My First Day of Kindergarten by Hyewon Yum, 2012. 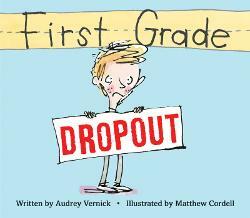 Ten days before she starts kindergarten, a young girl fears she will be a failure. A first grader mistakenly tells her three misleading rules of kindergarten: No stuffed animals, no cats, and “You have to know how to tie your shoes. Yourself. You’re not allowed to ask for help. Ever.” Even though she can count backwards from ten, she cannot tie her shoes. Scared that she will be deemed “Velcro girl” for life, she comically attempts to lose or destroy her shoes each day approaching kindergarten. On the big day, however, she discovers that most of her classmates do not know how to tie their shoes. Their kindly teacher announces that they will all be learning together and that she will be assisting them. The next day they will be bringing in stuffed animals and then counting down from ten. It looks like it will be a great year after all. 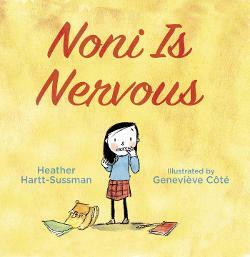 This is a fun way to approach the typical anxiety associated with starting kindergarten. The little girl is quite imaginative in how she tries to dispose of her shoes equaling some hilarious results, which makes this a fun book to read leading up to kindergarten at home or on the first day of kindergarten with a teacher. Headstrong Lola and her invisible friend Soren Lorensen are quite nervous about starting school for the first time. Lola gives her brother Charlie several reasons why she doesn’t need to go, but the ever-patient Charlie disputes Lola’s arguments by providing convincing reasons for Lola to attend. On the first day of school, Charlie nervously looks for Lola to confirm she is okay only to find her at home after school happily sipping pink milk with a new friend. Charlie is a patient and kind brother who can serve as a role model for older siblings everywhere. The mixed media illustrations work perfectly with Charlie and Lola’s quirkiness making it a fun story for preparing a child for school. It is the night before her first day of school and Birdie cannot sleep. She is too nervous. She thinks about the things she had heard from the good, “You will learn about EVERYTHING!” to the not-so-good, it is all work and NO play, the food is terrible, and her teacher might be a werewolf! Birdie’s mother reminds her that she and her dog, Monster, are never too far away. To better reinforce this point, she gives her a locket with a picture of her family inside. Birdie steps into school and is impressed with the beautiful new classroom. “It had everything. And everything had its place – even Birdie.” She is seen placing her coat in a cubby with her name on it. Birdie participates in many fun activities such as learning about letters, numbers, geography, singing songs, and creating art. During recess, Birdie is seen playing with a few children she already knows and making new friends as well. She returns home to tell her mother about her day. “She felt smart from all the things she learned. She felt proud of what she had done during the day.” Once again, she is pictured in bed not being able to sleep, but this time it is due to her excitement for her next day at school. 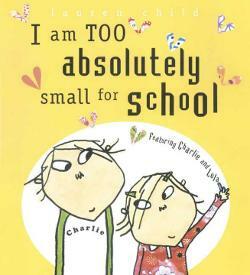 I love this series and think that this is a perfect book for starting school. 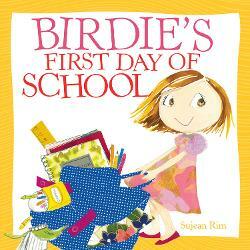 Birdie is a likable character and both the illustrations and the text provide reassurance to children that school is going to be a great place for them. Birdie’s locket is also a great idea for making nervous children feel closer to home. Other books in the series include: Birdie’s Big Girl Shoes, Birdie’s Happiest Halloween, Birdie’s Big Girl Dress, and Birdie’s Big Girl Hair. Another great book about staying true to yourself on the first day of school is A Bad Case of the Stripes by acclaimed children’s author David Shannon. While cutely drawn monsters excitedly prepare for school, Blue feels a bit nervous about this new adventure. His colorful friends happily introduce him to the teachers who share why school is so much fun. They learn the ABC’s and 123’s, create artwork, sing, spell, listen to books, and make friends during recess. By the end of the day, Blue loves school and can’t wait to return. The illustrations are colorful and bright making them engaging to children. This is an upbeat and vibrant book that includes several puns that adults and older children will enjoy. 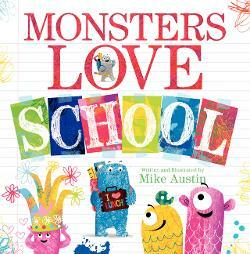 Children may also enjoy Monsters Love Colors by Mike Austin. While Dex is excited for kindergarten, his stuffed dog, Rufus, is feeling an eensy bit scared. Dex’s older sister, Jess, tries to reassure him, but it isn’t until he experiences the fun of kindergarten for himself that he relaxes. He loves the imagination station, playing with play-doh, writing letters, and meeting nice people such as his teacher and the custodian. “I’m going to l earn lots of stuff in kindergarten, but the thing I learned today was…Kindergarten Rocks!” The humorous story and illustrations will help ease the fears of future kindergarteners. At some point, almost every child is going to do something embarrassing at school. It is inevitable. 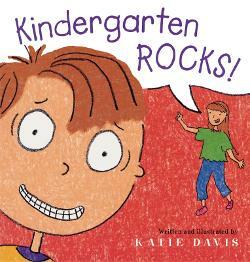 The character in this book accidentally calls his teacher “mommy” and the class erupts in laughter. He is convinced that he can never show his face at school again. Until one of his friends does something equally as embarrassing and he realizes sometimes it’s okay to laugh at yourself. The jagged illustrations perfectly capture the character’s anguish and I think parents and children alike will enjoy this terrific read. The laughs continue in Second Grade Holdout. Sarah Jane Hartwell does not want to get out of bed on the first day of school. She’s scared that she doesn’t know anybody and that it will be too hard. She begrudgingly makes her way to school and is met by the principal who shows her to her classroom. The illustrations cleverly hide Sarah Jane throughout the story and the twist ending reveals that Sarah Jane is actually the teacher. This is a funny story that may also comfort children in knowing that even teachers get nervous for the first day of school! Noni is a worrier. She seems to worry about almost everything, but especially school. What will she wear? Where will she sit? Worst of all, what if the teacher is mean? Noni goes to school and even though she is wrought with worry biting her nails and wringing her hair, she is befriended by an outgoing girl who makes Noni realize that school can be fun. 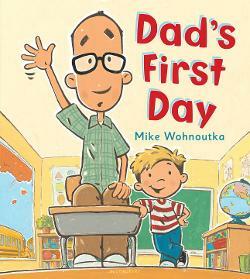 This reassuring read is a great one for any child preparing for their first day of school. 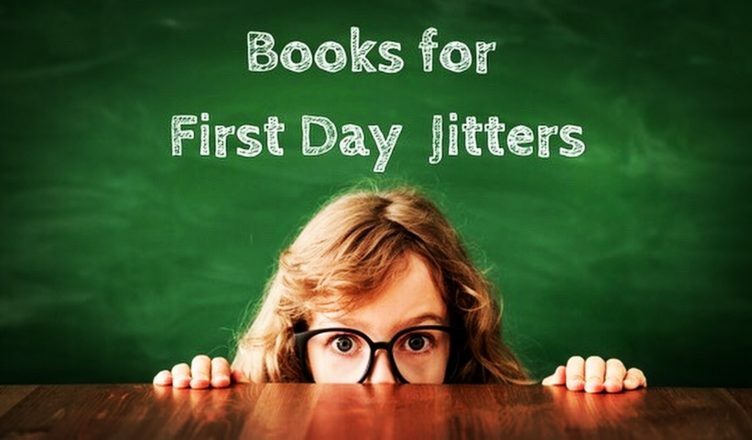 What are some of your favorite first day of school reads?